Pityriasis versicolor presents as scaly hyperpigmented or hypopigmented macules on the chest, abdomen, back and proximal extremities. The atrophying variant is very rare. We report a case of a 40 year old female who presented with atrophic hyperpigmented and hypopigmented macules with fine scaling all over the body with sparing of the face. The clinical differential diagnosis considered were atrophying pityriasis versicolor, atrophoderma of Pasini and Pierini, anetoderma, morphea, systemic lupus erythematosus and dermatomyositis. 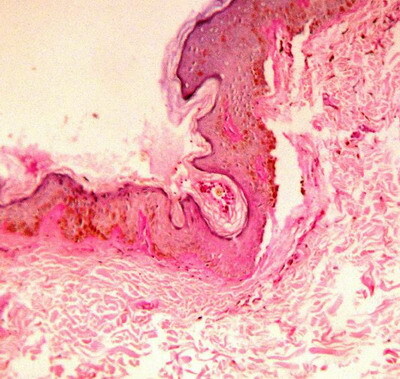 Biopsy findings supported the diagnosis of atrophying pityriasis versicolor. Pityriasis versicolor is mild, chronic infection of the skin caused by Malassezia yeasts, and characterized by discrete or confluent, scaly, discolored or depigmented areas, mainly on the upper trunk. Atrophying pityriasis versicolor is a very rare variant characterized by the presence of atrophy on the patches. This entity has been rarely reported in the Indian literature. Here we are reporting a rare case of atrophying pityriasis versicolor. 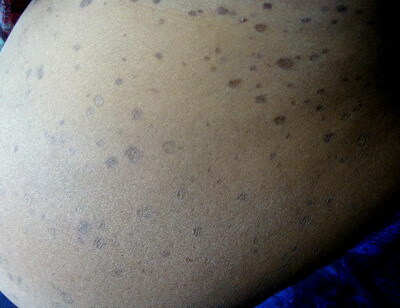 A 40 year old female presented to our department with hyper and hypopigmented lesions all over the body since 3 years. The lesions initially began over the abdomen and progressed over a span of 3 years to involve the chest, back, upper and lower limbs with sparing of the face. The lesions were asymptomatic without any itching or burning sensation. There was no history of application of any medications over the lesions. Examination revealed multiple hyperpigmented and hypopigmented macules with fine scaling and central atrophy over the trunk, upper and lower limbs (Fig 1,2,3). Her systemic examination was normal and there were no mucosal lesions. 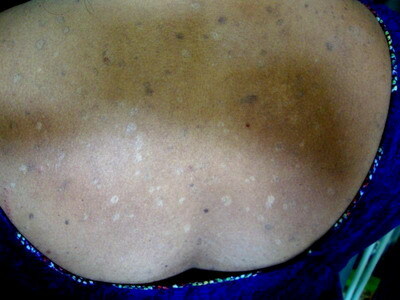 A differential diagnosis of atrophying pityriasis versicolor and lichen sclerosis was made. A skin biopsy was performed from the atrophic hyperpigmented macule over the abdomen. Biopsy showed few budding yeast forms in the superficial layers of stratum corneum. Upper dermis showed sparse infiltrate of lymphocytes, histiocytes and plasma cells (Fig 4). Periodic Acid Schiff (PAS) stain showed numerous PAS positive spores of fungi (Fig 5,6). The patient was treated with a course of systemic and topical antifungals and she was lost for the follow up. 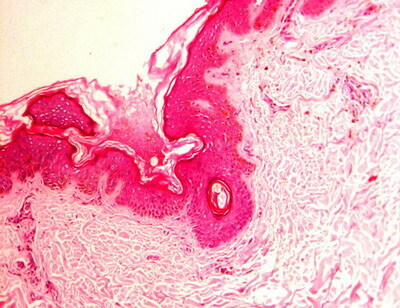 De Graciansky and Mery in 1971, first reported the skin atrophy on pityriasis versicolor lesions. Crowson and Magro coined the term 'atrophying pityriasis versicolor'. Long term topical steroid use was believed to be a cause of atrophy in many previous studies however, Crowson and Magro conducted clinical and histological study on 12 patients of atrophying pityriasis versicolor, and found steroid usage in only one patient. There was no usage of topical steroid in the present case. Crowson and Margo proposed that delayed type of hypersensitivity reaction (DTH) may be operating in Pityrosporum spore colonization of skin. None of their patients had eosinophils as a significant component of the infiltrate, which implied a Th-1-dominant process, in which histiocyte recruitment and activation by IFN- is a prominent feature. Histiocytes, like activated monocytes, are a likely source of elastases and could explain the dermal elastolysis noted in two of their patients. A Th-1-dominant immune reaction might contribute to the epidermal atrophy through elaboration of tumor necrosis factor (TNF); TNF-α causes apoptosis in keratinocytes and inhibits keratinocyte proliferation. Low concentrations of pityrosporum organisms promote cytokine elaboration like IL-1-β and TNF-α and high concentrations are inhibitory. This model is consistent with that seen in epidermal colonization, where low numbers of organisms are generally present on the skin surface. TNF-α inhibits melanogenesis through the NF-κB pathway by down-regulating tyrosinase promoter activity, thereby, it causes hypopigmentation. The clinical differential diagnosis considered were atrophoderma of Pasini and Pierini, anetoderma, morphea, systemic lupus erythematosus and dermatomyositis. However, histopathological reports were consistent with atrophying pityriasis versicolor. The prognosis of the disease is relatively good and the mycological recovery and disappearance of atrophic lesions can achieved with systemic triazole therapy or combined therapy of systemic triazole and topical imidazole. Many cases of atrophic pityriasis versicolor have been reported from Korea. [4,5,6,7] The case might be much more common than reported. Paucity of reports from India may be due to under reporting or some cases going unrecognized. Atrophic pityriasis versicolor should be included in the differential diagnosis of atrophic skin lesions. Histology is diagnostic for these lesions. 1. Hay RJ, Ashbee HR. Mycology. In: Burns T, Breathnach S, Cox N, Griffiths C, editors. Rook's textbook of dermatology. Oxford: Wiley-Blackwell 2010; 36:10-36.13. 2. De Graciansky P, Mery F. Atrophie sur pityriasis versicolor apres corticotherapie locale prolongee. Bull Soc Fr Dermatol Syphiligr. 1971; 78: 295. 3. Crowson AN, Magro CM. Atrophying tinea versicolor: a clinical and histological study of 12 patients. Int J Dermatol. 2003; 42: 928- 932. 4. Park JS, Chae IS, Kim IY, Ko DK, Chung H, Lee SW. Achromatic atrophic macules and patches of upper extremities. Indian J Dermatol Venereol Leprol 2013; 79: 270. 5. Yang YS, Shin MK, Haw CR. Atrophying Pityriasis Versicolor: Is This a New Variant of Pityriasis Versicolor? Ann Dermatol 2010; 22: 456-459. 6. Lee DB, Chae WS, Jung HN, Choi YS, Suh HS. 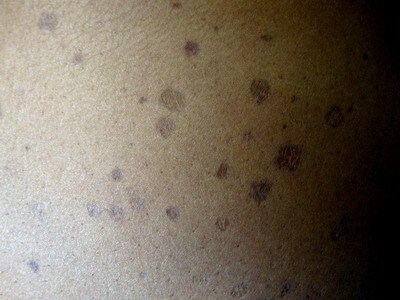 A Case of Pityriasis Versicolor Atrophicans. Korean J Med Mycol 2012; 17: 47-50. 7. Noh TW, Hong KC, Kang YS, Lee UH, Park HS.Atrophying Pityriasis Versicolor. Korean J Dermatol 2012; 50: 447-450.